Some blog posts are well thought out and take hours to prepare, while others just write themselves. Then there are the posts that result from cravings, which happened to me yesterday. I was leaving a comment on T. W.'s site, Culinary Types, where he had posted a mighty fine chicken fried rice recipe. I mentioned that I hadn't made fried rice in a long time and that I'd really love some pineapple fried rice. I woke up at 5:30 am this morning, and before I even thought of coffee, I thought of fried rice. I knew I wouldn't make it to the end of the day without it. So by 7 am -- with a good coffee buzz going -- I was cooking white rice to chill for tonight's dinner. By 5 pm my Thai Pineapple Fried Rice was cooked and photographed to post tonight. Though I'm not eating it for another hour or so, I had to sneak a couple spoonfuls during the photo session. (Come on, you do it too.) I was so pleased: the flavors of sweet pineapple, spicy ginger, and salty cashews mingle deliciously. I have no doubt that my fried rice craving will be satisfied tonight. In a wok or a large skillet over high heat, warm 1 1/2 tablespoons canola oil. Add the scallions, red bell pepper, ginger, and chili. Saute 1-2 minutes, or until lightly sizzling and fragrant. Add cooked rice, stirring frequently, for 3-5 minutes. Add pineapple, soy sauce, and cashews; stir until well coated and heated through, about 2-3 minutes. Sprinkle with the scallion greens, and, if desired, drizzle with sesame oil. Serve immediately. no ma'am, you certainly do not ignore a craving for pineapple fried rice! this looks so delicious! Gee, this would make a great meatless meal. It looks so refreshing. This would make a great side dish, too, for grilled chicken. My family is going to love this. I agree Susan! You never ignore a craving for fried rice! This is so wonderful! Love the flavours. And you got me craving for it now. I really want this rice! Now I have to buy another pineapple.Yum! Looks like there's a lot of room for hot chiles because of the sweet pineapples. I'm thinking this would make a great side dish for pan-fried fish. That fried rice looks perfect, just perfect! This is one of my fave dishes when we go out for Thai food. Damn! Now I'm craving it too! What a yummy fried rice! I always sneak bites of food when I'm photographing! WOw one of the best rice i have seen for a while, love the pineapple inthem. My daughter would love this, bookmarking them. The fried rice is soo delicious! And I do understand your craving. I have been craving fried chicken wings for weeksssss! Fried rice is one of the dishes I get cravings for, too. My favorite version has chunks of salmon, mushrooms, and green onions, with orange juice, oyster sauce and soy sauce for the flavorings. Sounds weird, I know, but it's truly delicious. Might just have to make some later today.... that's how cravings work! This is one of my favorite fried rice!Looks fantastically yummy. We make this with a little shrimp paste back home. Love the pictures. It looks good. We do love fried rice, but hubby hates pineapple. That looks heavenly! I sample when I'm photographing too. Gorgeous photo. Strange but pineapple is low on my list to enjoy when cooked (love it fresh). My husband on the other hand loves it cooked and fresh. Maybe I should do this just for him. elaine-It makes chicken a little more exciting. Hope they like it! jude-I had mine with pan fried tilapia and Jeff had salmon. It's lovely with both. sharon-I knew I wasn't alone! happycook-Let me know how you like it! anh-Now I'm gonna be craving chicken wings! lydia-It could become a chain of blog post cravings! veron-That must add wonderful flavor. I was planning on serving Chinese food on Friday and was thinking I would scour the web for a fried rice recipe, and voila! Thanks! Can't wait to try this! This is the second yummy post for fried rice I've seen this morning and now I've got a craving! It looks amazing! I haven't had fried rice in quite awhile... now you are going to get me craving it, too! I am completely on board with anything that includes pineapple. Brings back good memories of eating that decadently mediocre type of sweet and sour pork when I was a child. This has been ordered many times but never made at home. Shame! Now we shall have to make it. 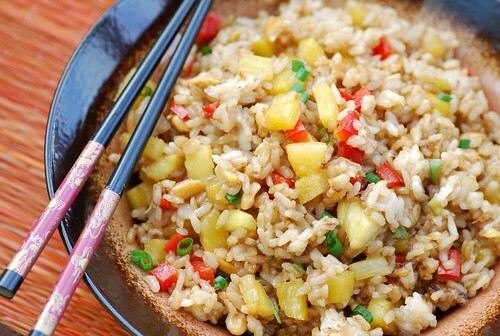 Now I can't help but be craving Thai Pineapple Fried Rice! This looks awesome! Well, I may have to return the craving! This looks delicious, and I think I've got little pineapple that needs using up! Maybe someday we can team up for a buffet! I agree - you absolutley can't ignore a craving like this. I never even knew it existed and now I'm craving it! Yummm. I LOVE pineapple in my fried rice! This recipe is definitely being bookmarked :) Can't wait to try it! I'm definitely making this for my kids. They love pineapple! Thanks for a great recipe! I love this recipe for it's simplicity! I love pineapple anything too, my family would love this. I am dying for some of this now. You have passed the fried rice craving on, and I have some leftover rice sitting in my fridge begging for this royal treatment. Looks divine. No you certainly cannot ignore a craving for something so beautiful! Wish I could have some of it now for my dinner. Fried rice of any kind is one thing I can really get a craving for. Great, now you've done it! This looks sooo tasty! Love the pineapple! I make fried rice on and off, but never with pineapple in it. Must try this one too. I'll bet this would be really good with Thai coconut rice. Can't say that I've ever made fried rice, but this looks delicious. This definitely goes on my list of want-to-make. Wow, that fried rice looks really fluffy. Great technique! And smart that you chilled the rice in advance. Very impressive! The heck with the spoonfuls, I would have eaten this for breakfast! Can't wait to make it, Susan. i was trying to decide between a recipe like this and a noodle recipe before I hit the market today. I went with the noodles, but looking at your photo, I think I made the wrong choice. yum. 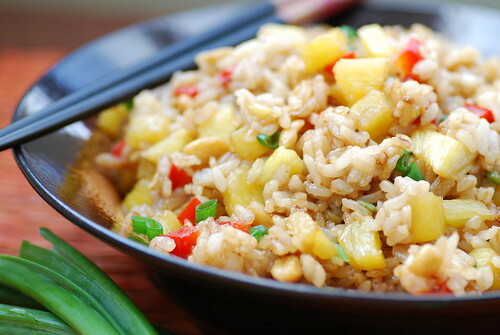 Love rice with pineapple...and the one that you feature looks just fantastic...yummie! Would have some of it just right now. Nice pictures as well. Oh those tofu cakes sound fabulous! I'm not keen on warm pineapple so, for me, these gingery tofu cakes sound yummy! I love recipes like that that just scream out for you to make them! What a colourful fried rice! I like the pineapple in it! ashley-Don't you love when that happens? karen-Now you've got to make it! zita-I like them better smaller. laura-Mmm... I used to love sweet n sour pork whenever we ordered take-out. tw-Ooh, an all-you-can-eat Chinese buffet? I'm in! christie-That's what I like to hear! abby-You could just omit the nuts too if you're concerned. wanm-Great! I hope you like it! carol-Hope your kids like it! Thanks. aparna-It's really good. Hope you give it a try! cris-That is so kind of you to say. Many thanks. erica-Thanks. I'm glad you liked the pics. ben-Yeah, chilling it helps prevent it from clumping. Thanks! juliana-Oh, thank you so much! diane-I love those tofu cakes. Hope you try them! johanna-Just save some from the next batch! Made this last night, it was delicious. Added 1/4 pound small shrimp and some raisins. 2 of us ate all of it. I was made this for dinner tonight, and it was delicious! I was a little nervous it wouldn't have enough depth of flavor, but it turned out scrumptious. even my meat-loving husband liked it. I'm trying to do several meatless meals a week both for our health, so I really appreciate easy, thai pineapple fried rice meals. thank you for shearing your post. leo-Mmm... raisins sound wonderful! I'm so happy you both enjoyed it!